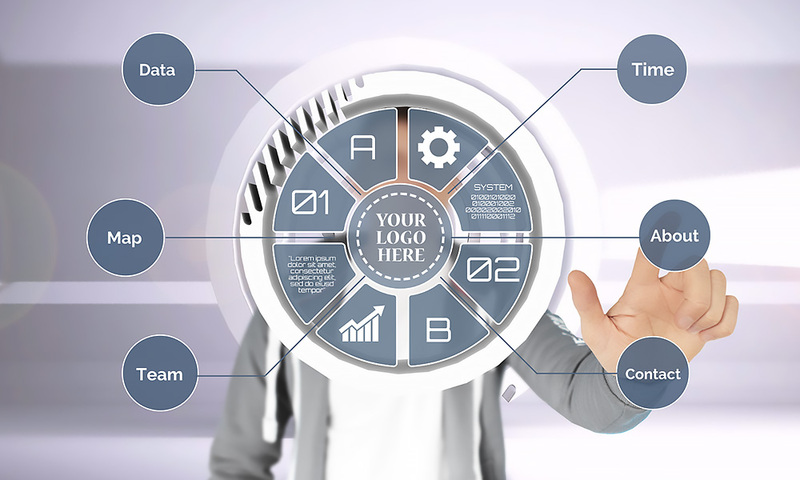 A technology related Prezi Next presentation template. Man using a hovering touchscreen circular interface. Insert your own content topic circles and talk about the future of technology. How will the user interfaces of future AR ja VR touchscreen apps look like? We don’t know, but here’s our best guess! 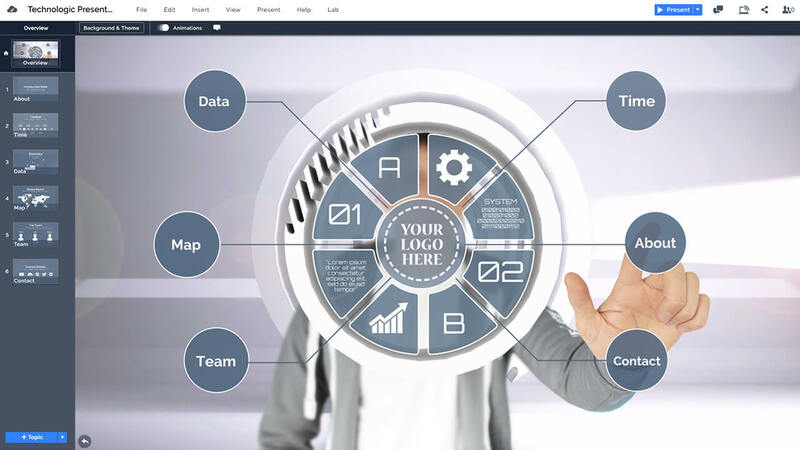 A creative Prezi presentation (+Powerpoint) template featuring a futuristic and circular 3D hi-tech user interface. A man with a gray hoodie pointing a finger at a hovering touchscreen display. Make a technology related presentation and customize this template by adding your logo design into the middle of the 3D circle. The overview slide features 6 topics which are connected to the main circle in an infographic style. Rename the headlines on the circles and zoom in for your own presentation content and of course add more slides into any topic. The template has a nice 3D parallax effect while zooming to the topics, and together with the futuristic design it makes the presentation even more hi-tech. Use technology circle for presenting about a company or business idea or simply make a slide deck about a universal tech topic. The presentation also includes a few example placeholder slides which you can reuse or replace with your own content. 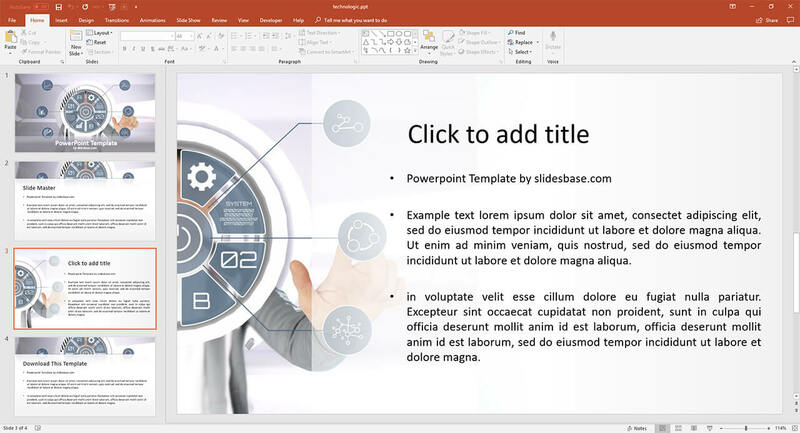 If you want to make a fascinating technology presentation, but don’t want to stick with the boring templates, then this is the right way to go. This entry was posted in Best Prezi presentation templates, Prezi Next Templates and tagged 3d ar technology example, 3d tech circle, ar interface, AR presentation, circle, circle interface template, creative technology presentation, future interface, futuristic screen template, prezi next template, prezi next templates, prezi template technology, technology circle presentation, technology presentation, touch screen template presentation, touchscreen interface 3d, vr interface.